Lesson 1.5: The Brain Dominance Theory – How to Learn Like a Pro! The next learning theory reviewed in this series is somewhat controversial. It is called the “Brain Dominance Theory,” or, technically, Lateralization of Brain Function. This theory suggests that certain approaches to thinking and learning differ according to the hemispheres, left and right, of the brain. Critics of this theory claim it is the result of pop psychology more than sound science. 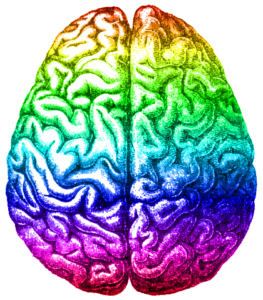 Indeed, common sense indicates that, of course, we utilize all parts of the brain continually–which is why I like the multi-colored graphic of the brain. It infers a kind of brain symmetry–if not of function, of form. To utilize your own “both/and” brain power, first read the article linked above, annotating for, or taking notes on, information you want to remember and include, perhaps, in your mid-term portfolio project and for your responses to the exercises below. Review the chart below that gives a brief summary of the so-called right/left brain kinds of activities, thinking, and preferences. Based on the information gleaned in the article and in # 1, design two 8 1/2 by 11 inches posters, one for each side of the brain, illustrating the same information as is on the chart, but according to how you think each kind of thinker/learner might design them. For example, the poster for “right brain” thinking/learning might be much more colorful. The student might also think of some sort of paper structure (origami?) by which to illustrate the differences. Enjoy. Based on the information in the article and the chart, above, compare how friends, “R.B.” (Right Brain) and “L.B.” (Left Brain) would respond to planning a weekend getaway to the fictitious “Wilderness Resort” located in the lush, Pacific Northwest of the U.S. Activities could include: planning, packing, traveling to and from, meals, indoor/outdoor activities, and so on. Contrast R.B. and L.B. regarding at least 5 different activities. EXAMPLE: regarding packing for activities both indoor (heated pool, fully equipped exercise room, a few casino type gaming tables, dancing, etc.) and outdoor (hiking, boating, guided field trips through an old growth forest, etc. ), RB takes a casual approach: whatever is clean and easy to pack. LB first checks weather forecasts and maybe the location of any poison ivy that might be growing in the forest. Though it is controversial, how do you think knowing about the Brain Dominance Theory can still help you in the learning process? As you are thinking about this subject, consider how you might enhance your current response to learning and completing assignments or tasks by trying out either new left-brain or right-brain approaches.